Winter both excites and disheartens me. I love the holidays, the extreme sports (polar bearing!) and the occasional snow-scape. Yet, despite the fun of it all, I sure miss the greenery of the other three seasons. Of course that could be resolved with a trip south between December and April, but alas, the opportunities usually fall during the nicer months. One such untimely foray south would be a previous business trip to Florida during some of the nicest weather in the northeast. Though the timing was not the greatest, I made the most of it with some beach visitation and a trip to Fort Lauderdale's lovely downtown for good coffee. 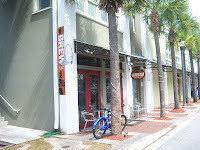 The cafe visited was called Brew Urban Cafe, one of the only coffeehouses of rumored repute in all of Florida. Arriving one warm morning, I discovered convenient parking in front and took in the beauty of the surrounding area. Eventually I found my way through their doors and found a great cafe, with one of the nicest pieces of wall art I've ever seen, dark wood furniture and beautiful lighting. Serving up Intelligentsia, I ordered a cup of the Brew's house blend via drip and an espresso of Black Cat. 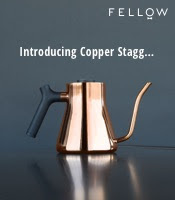 The drip, though a little stale, delivered notes of chocolate milk, cloves, fig, minestrone and a little chili powder; a decent coffee overall. 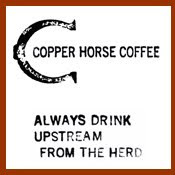 The espresso, pulled of a medium volume with marbled crema, held bits of sugar cane, dark cocoa, lemon, a little cinnamon and some coriander (good showing of Black Cat). The tea is Intelligentsia and Island Rose. After my visit, I now know exactly where in Florida I will go when I get the chance to winter there in the future. Make a stop at Brew Urban Cafe if you happen to be nearby. I sadly have not made it to Indonesia but one day, I would love to make a stop in. Oh so glad to find an excellent cafe in Ft. Lauderdale! Thanks for the excellent reviews! (here's the link actually .. It's this strange song this guy in Australia made up about how much he loves coffee - (i'm from australia). Keep this great stuff coming! Nice blog you have here. I pretty much lurk the internet when I'm bored and I really liked you view on things. I'll bookmark the site and subscribe to the feed!